Decatur is part of the Atlanta Metropolitan Area and is known as a suburb. Boasting 21 neighborhoods and historic districts, this tree dense city is also home to dozens of thriving local businesses alongside national chains. Home to Agnes Scott College, Emory University and Georgia Perimeter College, Decatur has a mix of full-time residents and a rotating student population. The Decatur MARTA station provides easy access to Downtown Atlanta for commuters as well as access to Braves games, Falcons games, Hawks games, concerts and more. 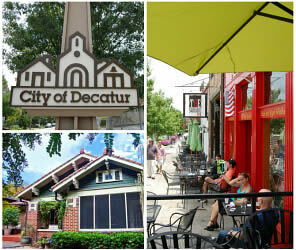 The Decatur community combines the big city feel with suburban living. # Everything was great - lowest cost of four quotes, showed up on time, did the job as promised with zero damage to our yard. Other companies wanted to use a crane due to access issues, which would have damaged the yard. These guys brought in a crew, cut it up in sections and carried it out and still finished in less than a full day. We highly recommend them.